On average, caregivers spend 13 days a month on laundry, house cleaning, transportation, giving medication, and shopping for and preparing food. The Gallup-Healthways Well-Being Index reports that caregivers spend six days a month feeding, dressing, grooming, walking, and bathing, and 13 hours a month researching disease and care services, coordinating physician visits, and managing financial matters. Caregivers provide necessary assistance in everything from personal care to medical aid. And yet, they are overlooked, under-appreciated, and unpaid. It is in honor of them that the Providers Association for Home Health & Hospice Agencies designated the third Friday in February as National Caregivers Day. Take some time this Friday to appreciate the dedicated individuals caring for those requiring long-term or hospice care. According to the National Alliance for Caregiving, approximately 43.5 million caregivers have provided unpaid care to an adult or child in the last 12 months. Most caregivers care for one adult while 15 percent care for two, and 3 percent take care of three or more adults. Over 75 percent of caregivers are female, and they spend as much as 50 percent more time providing care than males, according to the Institute on Aging. Many caregivers of older adults are elders themselves, and yet the number of hours they spend caring for others only increases with age. According to the Administration on Aging, the average age of someone caring for a person 65 years or older is 63 years old. Of these caregivers, one third report being in fair to poor health. 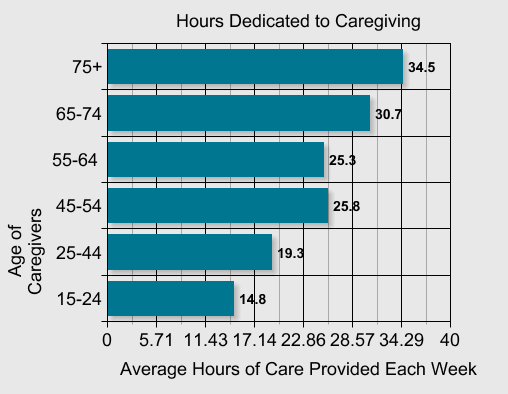 Caregivers 75 years and older provide 34 hours a week on caregiving tasks, while middle-aged caregivers spend 21.7 hours, according to the National Alliance for Caregiving. Additionally, 40 percent of caregivers are in high-burden situations, and the burden of care only increases with the number of hours of care provided, according to the National Alliance for Caregiving. The economic value of the services provided by caregivers has increased over the last decade, with an estimated value of $470 billion in 2013, up from $450 billion in 2009, according to the AARP Public Policy Institute. Let the caregiver in your life know what they’re worth. Honor the fourth annual National Caregivers Day by offering to relieve caregivers of some of their typical tasks, like laundry, cooking dinner and running errands.